Wishing you many Christmas Blessings Kitty. I made your crockpot chocolate candy last year and couldn't believe how easy and tasty it was. Thank you for the delightful your! 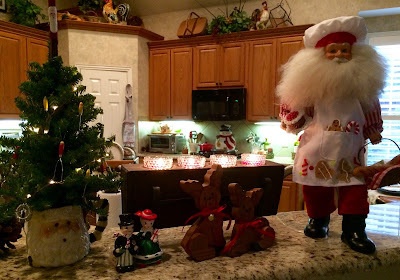 Kitty, Your home and your kitchen is so kozy with all your Santas and Christmas touches! I would love your easy Crock-Pot chocolate recipe, especially with the addition of the cranberries! This is amazing. I would never have thought of making candy in a crock pot. Thanks for being a stop on our tour. I love your special Christmas pieces! 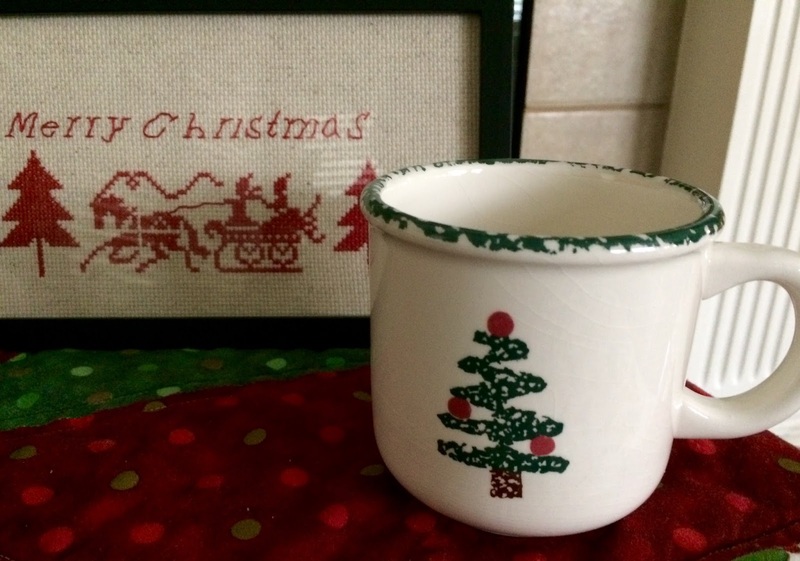 There is nothing quite like the memories associated with Christmas! The recipe sounds wonderful. Have a very blessed Christmas! Crock pot candy sounds like perfection and easy. 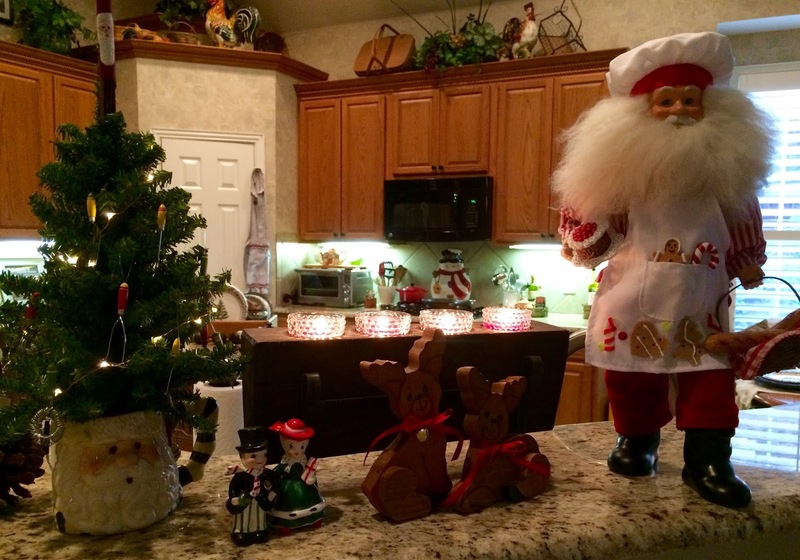 Your home is so welcoming and those Santas are priceless. I really like the one in plaid. Hope you have a Merry Christmas Kitty! Kitty your collection of Santa's are utterly charming! Love the one your son made and the bunny slipper wearing Santa. I can't wait to try your recipe! Hi Kitty, oh your home is just filled with charm and cozy Christmas goodness. I love your collectible Santa's. The one your son made is a treasure. He is truly talented using the mop head for the beard!! LOVE the gorgeous quilt you made. The pattern is beautiful. The dishes you and your beloved collected are precious!! Love the willow tree and the sweet utensil tree in your kitchen. The candy looks so good and I will certainly be trying this recipe. Thank you for sharing your lovely home tour and candy recipe. Your home is an inspiration. Hi Kitty, your home is decorated so pretty with Christmas decorations! I just love the crock pot chocolates recipe too. Kitty, your home has the most coziness I have seen in a long time. I love that each and every thing you put out has it's own history and memories. That's what the season is all about. Love the Santa that Mike made.Also your little kitchen tree(I didn't put mine out and now I wish I had). I just want to crawl into the pictures and stay awhile. Merry Christmas! I've never made candy in a crockpot before, but now I might try it. Thanks for posting the recipe! 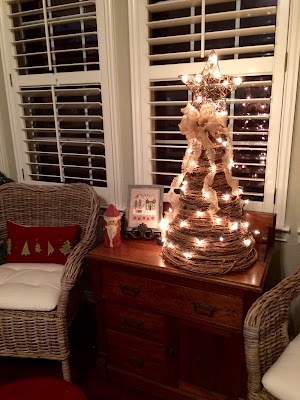 I enjoyed seeing your Christmas decor, and I linked-over from Art and Sand. My dear Kitty, your home is looking ever so sweet and festive for Christmas! And my, your recipe sounds wonderful! Thinking of you, dearest lady. Have a wonderful day. Love and hugs! Kitty, Your home looks warm and cozy and inviting! I love cranberries and chocolate together. Yum!!! Have a blessed day, dear! I love your Santa collection, especially the one your son made! Hi Kitty! 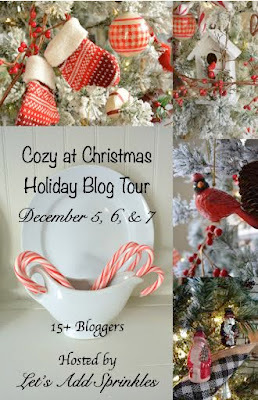 Your home looks so cozy all Christmased up and your Santas are darling! Of course you always leave us something to eat! :) Yummy! Hope you're doing well. Kitty, your home looks very cozy indeed! Love all your Santas and special pieces with all the memories. The candy recipe sounds yummy. And I'd love some tea please! Christmas blessings to you! Your special Santas are such treasures and your cozy home is filled with the best kind of Christmas memories! Thank you for the tour and for your delicious sounding recipe! I wish you and your family a blessed Christmas. The best Christmas decorations are the ones with happy memories attached! The crock pot recipe looks great. I look forward to trying it. It would never have occurred to me to make chocolate treats in my crockpot, but then nothing you do surprises me. I always enjoy visiting to see Christmas decor. Thank you for the tour and the special things that you shared along with the recipe. Who would have thought that you can make candy in a crock pot! Once again, I have enjoyed my visit to your home and kitchen. It always feels like a visit with an old friend. Did you publish this recipe before? I think I made this a couple of years ago. At any rate, thanks for publishing now, because I want to make it again! Thank you for the kitchen tour, Kitty. 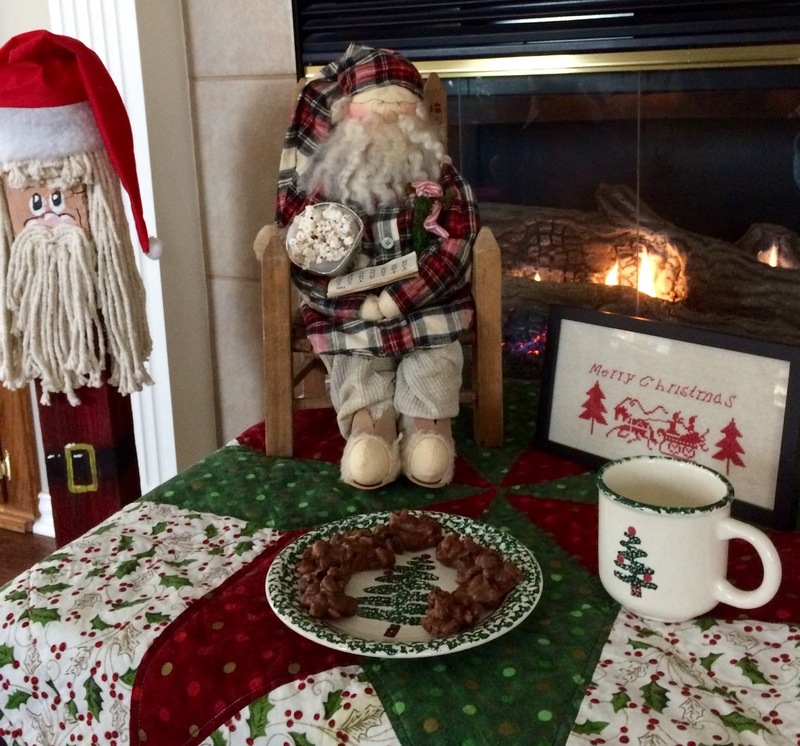 I enjoyed seeing your delightful Christmas decor and hearing about the special memories associated with them. The crockpot chocolates look delish! It's been unseasonably warm here so I've yet to enjoy tea by the fireside! Kitty, Your kitchen is so cozy! Love your Santa's with special meaning, Christmas dishes and yummy candy recipe. Cranberries make it interesting. Your quilt is darling and does show off your dishes. Oh Kitty, it was fun hearing about how you and your family collected the various bits and pieces of your Christmas decor. The Santa your son made must be a real treasured piece for you. Thank you for sharing your holiday decorations with us. Mmmm, I just love chocolate and your recipe sounds so yummy! 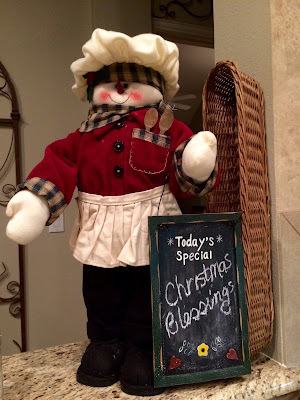 How wonderful to be surrounded with so many beloved Christmas items that hold dear memories! Thank you for sharing them with us! Your crockpot recipe is just the thing for the holiday baking busy season. I enjoyed seeing all your decorations and hearing about their memories. Isn't it fun to remember how you received each one? Your cozy decor is lovely, Kitty and so filled with memories of the wonderful people in your life. 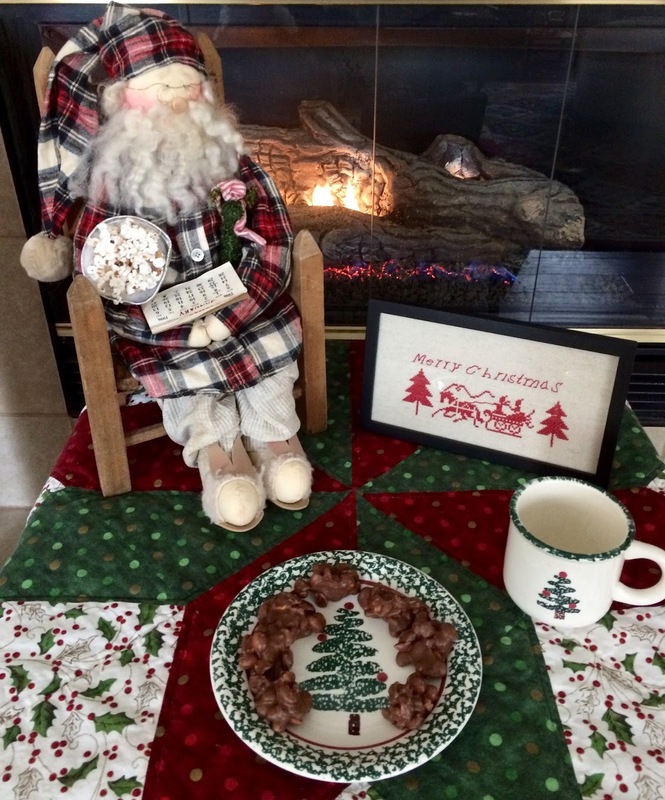 Yummy chocolates and I've never heard before of doing them in the crockpot - what a great idea! Kitty, chocolates, oh, yes! My husband likes to make peanut butter fudge, but give me chocolate, please. I will try this. I enjoyed seeing your different Santa figures. Happy Holidays! This makes me want to go out and buy a crockpot. Season's greetings, Kitty! It's absolutely the little things like you've described that hold Christmas memories near and dear to my heart too. Wishing you feelings of love in the present as you move through your home, surrounded by all those items from the past. Does that candy taste like a Chunky bar? This would be dangerous! Thanks for participating in the blog hop...off to visit more! Your home looks so lovely, Kitty. I admire the fact that you have kept your many gifts from loved ones over the years. That Santa is darling that your son made for you, quite special. Your recipe sounds like a winner, so easy and no fuss. Such fun decor! Definitely cozy and I will cozy right up for some chocolates! How festive your cozy home looks, Kitty! Your Santa collections are adorable...I have an Santa chef ornament that looks exactly like your one n the kitchen. Would you believe I saved this recipe a LONG time ago & was just at the store yesterday to buy all the ingredients to make it? I'm taking it to one of my quilt guild parties! Thanks so much for sharing so much of yourself with us. Your mop head Santa and popcorn bunny slipper Santa are too cute for words Kitty! Any place would be cozy with a plate of homemade chocolate candies, yum! You look set for a very jolly holiday! Kitty, this recipe looks and sounds wonderful ~ perfect nibble for the holidays. Love all your Santas ~ we share a love of those! Kitty, your decorations are sweet, plus they have special meaning and memories! I pinned these chocolates a few years ago, but have yet to try them. Loved this tour and thanks for sharing with SYC. I like your decorations and the recipe looks really good. Happy December. Kitty what a wonderful post, so many features, the Santa is darling. I have always wanted to make these chocolates! Thank you for the recipe. Of course I always enjoy a peek into your pretty home. 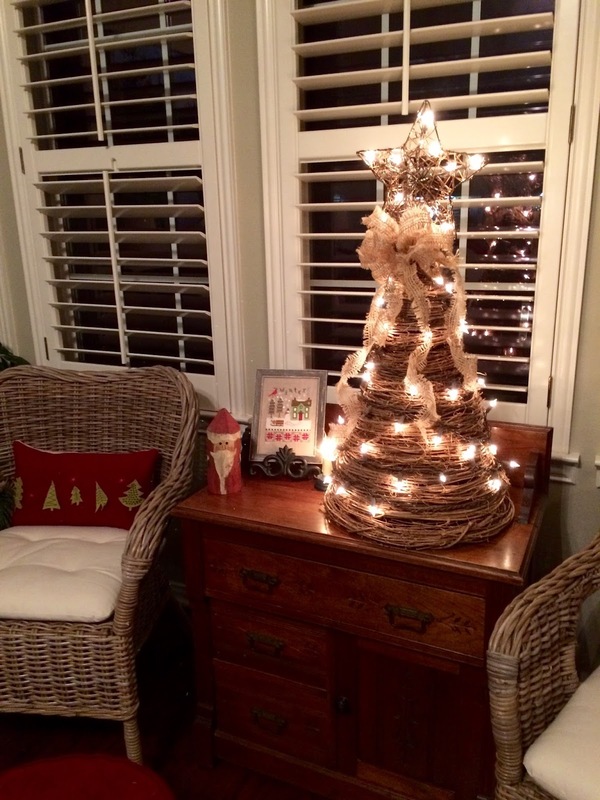 Thank you for sharing your sweet Christmas decor and memories with us too. 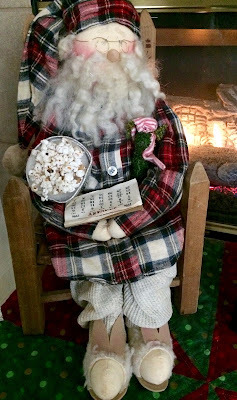 Such cute Santa's but don't eat that popcorn - ha! Your chocolates look amazing. We would love those! thanks for sharing! Your home is just exactly like you, Kitty; warm and inviting! Love all your Christmas touches. Your quilt is lovely and does look wonderful with your special dishes. And those chocolates; yum! You always share the neatest recipes. Kitty, it would never occur to me to make candy in the slow cooker! I'll definitely have to give this a try. If you decide to eat a piece of that popcorn, DO let us know how it was! :D Your kozy kitchen and family room look so inviting. My Granddaughter is helping me as we go through the comments tonight and we love your Crock Pot Chocolate, we are pinning that recipe and hope to make it soon! Your home is always so warm and inviting with that lovely fire to welcome your guest. We really appreciate you sharing with us at Full Plate Thursday and hope you are having a great day! Kitty, I'm back again. Your Santa figures are fun! wonderful post and I am definitely trying this recipe! This recipe looks too easy! Thank you for sharing at Dishing It & Digging It! You have such darling Christmas decorations, so special with lots of good memories for you! Thank you for the recipe! Yum! Praying you are having a good holiday season.